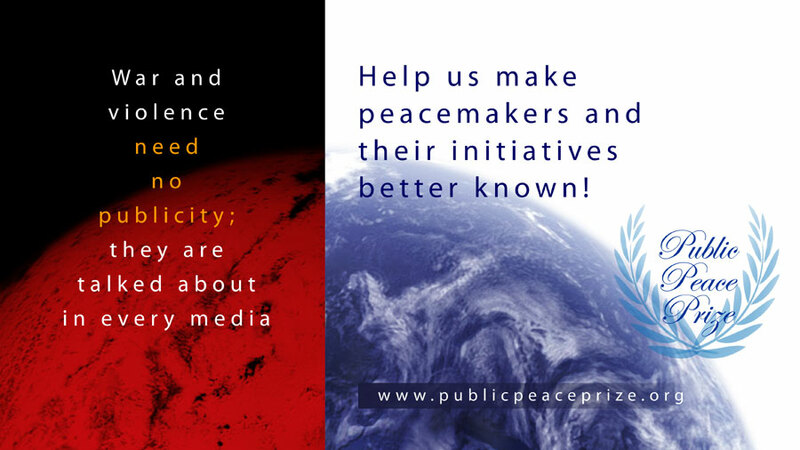 First of all, we wish to thank you for your precious collaboration in nominating a candidate for the 2015 edition of the Public Peace Prize! At the close of the nomination period, a total of 218 nominations for 24 different candidates had been received. Of the 24 peacemakers nominated, 12 met the criteria of a minimum of 10 nominations each, by 10 different people, with 10 lines of text explaining why their peacemaking efforts should be recognized. The other 12 can still be nominated again next year! Over the past month, a compilation was made of the nominations for each of the 12 eligible candidates, and volunteers have been hard at work writing profile summaries from the texts received, which were then into translated into English, French and Spanish. These 12 candidates will now be presented to the public on our website, one by one, over a period of twelve days. Because the first and only goal of the Public Peace Prize is to make better known as many peacemakers and peace initiatives as possible, including those who are virtually unheard of, we will start with the least-known candidates, and present a new candidate each day until they’ve all been introduced. Param pujya shri 1008 rastra saint dr vasanth vijay ji m s is a peace maker. Vasant Gurudev is real Peace Maker. he is IDOL for Jains. Mahe India Honoured By Voting Param Pujaya GURUDEV DR. VASANT VIJAYJI MAHARAJi is peace maker His HOLINESS is atrue world peace leader. Shri Dr. Vasanth Vijayji’s efforts for world peace making are appreciatable. He really deserves the award. His Vision to eradicate poverty n hunger, universal primary edication, gender equality, prevention of animal poaching, environmental sustainability, combay hiv & aids, developing global partnership for developnent, religious And spiritual activities , these All are appreciated. We support His holiness param pujya Vasant Vijayji m.s and request all to support him. His Holliness Dr. Vasanth Vijay Maharaj is an Ambassador of World Peace, who have transformed millions of lives towards creating a Peaceful World. He is appointed as the Diplomatic Counsellor of India by the International Parliament for Safety and Peace in Sep 2009 and Issued a Diplomatic Passport. He has received many Honors, Titles and Awards for his Pioneering Efforts in shaping world towards peace and harmony. He truly deserves this public peace prize 2015 award. I support Dr. Vasanth Vijayji MS for his global peace activities. he truly deserves the PPP 2015. I VOTE HIM FOR HIS GREAT AND HOLI ACHIVEMENTS.